All rights reserved. This sample is intended for use only on your personal device or computer. This sample or any portion thereof may not be reproduced or used in any manner whatsoever without the express written permission of the publisher except for the use of brief quotations in a review. Dedicated to Andy, your encouragement remains. His eyes fixed on the metal gate ahead and the bile caught in his throat at the sight of the man lumbering toward it. Never had Kirkgordon entertained the thought of seeing this broken figure again, let alone agreeing to babysit this most curious of cats. Too much had gone before. Too much had been lost. The light that had lit up his life for the previous twenty years had been all but extinguished. It was the price that he had paid for following this shambling hulk into the very gates of hell. Contemplating this moment on the banks of the Miskatonic that morning, Kirkgordon had not foreseen the sheer hatred which now welled up inside. His wife had left him, his kids saw Dad now only one week out of four and his friends had abandoned him, all because of the episodes that now plagued his existence. Only the deepest depths of faith had kept him sane enough not to be locked up alongside the figure approaching him, a resident of Arkham’s finest secure facility for the mentally compromised. His fists were clenched tight, his chest fought for breath and his blood coursed wildly. He muttered the most bitter of welcomes to the hated demon emerging from the sanatorium. A large, black, clearly governmental saloon was waiting at the sanatorium gates with five men in attendance. The first was Kirkgordon, dressed in black jeans, black ankle cowboy boots, a greyish T-shirt and a black leather jacket. He was nearing forty and it showed on his hair, or rather what was left of it. Greyness had taken over much of it, due to the incident he said, not age. Kirkgordon was stocky but not particularly tall. While not out of shape, he didn’t have the looks of Adonis. Yet, of the men there, he was surprisingly the most dangerous. Beside him stood Lord Farthington of Her Majesty’s most secret of services. A tall English gent adorned in the customary Savile Row suit, with a bowler hat and umbrella “just to keep the yanks honest”. He sported a most stunningly twirled set of whiskers and an accent that spoke of nobility even when it swore. Looking like the finest of British fools, he was there to keep things in order. Kirkgordon had been introduced to Farthington through an old, long-forgotten contact. His own research had drawn a blank but his contact had filled in the detail. Unseen mastermind of many conflicts and coups, Farthington was a man who liked to keep his hands from the dirtier side of life. Like a chess grandmaster, he enjoyed manipulating and coercing others by means fair or foul but distinctly non-physical. Now in his later years, he headed up one of the government’s more covert organizations, one which looked into the strange and unusual but definitely alarming. The other men were employees of the FBI: one senior field agent and two strongmen, apparently there to control any hotness that the situation induced. They were dressed in black suits, possibly for Lord Farthington’s benefit, and the firepower they each carried was immaculately concealed by the loose-hanging jackets. The FBI men moved to flank the releasee as he approached the car. Farthington stepped forward to greet Austerley while Kirkgordon turned from them all to take his place on the passenger side at the front of the car. Austerley was not small in stature, measuring some six foot, and was carrying some bulk despite his incarceration. Hiking boots went well with the combat trousers he wore but then his garb broke out into a confused mélange of Christmas reindeer jumper and green and white bobble hat. His hands were chunky and somewhat hairy, while his face looked harried to the point of abuse, jowls dropping like those of a dog. Farthington thrust a cigarette toward Austerley, apologizing that they were “American”, before brandishing a silver lighter. Austerley dipped awkwardly to light the gratefully received stick of tobacco. As he drew in his first taste of fumes, Kirkgordon uttered in guttural fashion that Austerley should get his “worthless arse” in the car. Jumping to Austerley’s side, the Americans tried to encourage him into the car but he just turned around, leaned back on the car, and smoked slowly, deeply and passionately on his first cigarette in five years. Kirkgordon glowered. The fact that Austerley had positioned himself clearly in his line of sight via the wing mirror hadn’t helped. Farthington agreed that Austerley’s posterior should position itself into the car sooner rather than later. At the agent’s urging, the car was cruising away from the sanatorium a mere three minutes later. Silence dominated, unnerving the Americans, who would occasionally touch their firearms through their jackets as if some weapon-stealing gremlin was afoot. At first this went unnoticed by Austerley and the reverential quiet continued. But then the newly freed man caught a glimpse of the Americans’ guns. The agitation slowly built up through a shaking leg, then involuntary movements in the shoulders, before a sudden cascade of manic shouts sent the saloon’s occupants into a frenzy. The driver spun off the road on seeing Austerley’s flailing arms in the rear-view mirror. The beast was stirring. Farthington’s cool exterior lost its calm and a worried frown crept across his face. Both of the Americans in the back leapt onto Austerley, trying to suppress him, as a wild strength born from fear surged through his body. The drawing of the driver’s gun sent Austerley into even wilder hysterics. “Put the guns down. Gentlemen, holster your weapons.” Kirkgordon sounded calm but extremely pissed-off. When the driver failed to react he found his gun taken from his hands and watched the chamber and ammunition fall to the floor as separate entities. One of the other Americans responded by putting his gun in Kirkgordon’s face. He would wake up ten minutes later to find caked blood around his nose and his weapon missing. The third American was a quick learner and while holding Austerley with one hand, dropped his weapon to the ground with the other. The car had stopped at Hill Street close to Hangman’s Brook. Stepping out of the front seat, Kirkgordon reached in and extracted Austerley before leading him firmly but gently to a bench overlooking the brook. “What was that?” Farthington had recovered his dapper attitude. Standing aloof from Austerley, he looked deep into the dispassionate face of Kirkgordon. The Americans had been left in the saloon. “Guns. He hates guns.” Kirkgordon spat on the ground. “Guns. That’s all. Just guns?” Farthington’s eyebrows stood up like the orchestra at the end of a concert. “Yes, he hates guns.” Kirkgordon did everything but say Farthington was dumb. Too long in the tooth, the agent didn’t take the bait. “Leave him with me. It’s safer. I understand him.” Kirkgordon felt Farthington staring into the windows of his soul. Protocol was being weighed up against practicality. Austerley stared at the slow-running water in Hangman’s Brook. Sitting on a small wooden bench with pursed hands, he looked like he was throwing invisible bread to non-existent ducks when the occasional fits and starts from the incident hit him. Kirkgordon sat down beside him but could only stare off into the fields, barely acknowledging the nervous man beside him. Farthington was an old pro and produced a collapsible seat which he placed directly in front of the bench, imposing himself into the view of both men. The British agent, ready to deliver his orders, was keen that neither man misunderstand or ignore them. A curt cough focused their attention on him, and Farthington set off on an explanation devoid of humour or warmth. Luckily for him, the subject matter was enough to entrance the listening pair. “Which department is that?” interrupted a serious-faced Austerley. Austerley became agitated, looking all around him while not fixing on anything in particular. If his mind had had a steam whistle, it would have been calling all to clear the tracks ahead. “Austerley, shut it or I’ll put you back down that hole personally!” Kirkgordon had taken particular offence at being lumped in with the “clowns”. “Yes, Mr Austerley, a degree of decorum, if you please. And also kindly elaborate on this Zahn fellow. Most intriguing.” Farthington always cut through any nonsense to get to his answer. He was the money, the man who could pull the strings. Austerley had his shoulders hunched up now and was in full flow. With every passing detail the excitement across his face grew and the previously tired jowls visibly reddened with life. Farthington kept nodding in anticipation of the pertinent exposé, but Kirkgordon was sombre, pondering every word. Austerley stopped speaking and went back to staring intently at the brook. Farthington gave Kirkgordon a look which said: Is that it? A shrug of the shoulders replied: How should I know? There was a half-minute of calm and tranquillity with only the babbling of the brook. Then Kirkgordon’s breath pulsed quicker and built like a string crescendo before the awaited outburst. If incredulity could be delivered in a look then Austerley was a master postman. After dismissing Kirkgordon as clown number one, Austerley stared questioningly into the eyes of the British agent. Finding no response, generosity compelled him to elucidate for the feebler minded. “Zahn lived at the Rue d’Auseil. This is an abuse of the French language, collapsing the original ‘au seuil’, translated as ‘at the threshold’. The street is seen as being on the cusp of somewhere else. And ‘Улица на пороге’ is how they say it in Russian.” Austerley, instead of glorying in his victory, became drawn. His face had lost its red glow and had turned a dull pale. “What is it?” Farthington sensed the feeling of unease. “The music. It has to be the music.” Kirkgordon was now standing, as if this enlightening of the audience signified his full emergence onto the academic scene. “Of course it’s the bloody music! But why?” Farthington snapped. Kirkgordon, chastised, sat down. Austerley stared at the brook. After a few seconds he stood up and walked to the edge of the bank, deep in thought. Suddenly, he whipped his head round to stare at Farthington with a look of horror. The agent had seen enough people under extreme fear to recognise the look of hopelessness that was forming on Austerley’s face. “What, Austerley?” came the gentle whisper from the string-puller. “Invite it, actually, but yes,” Austerley corrected. “So, either it needs to be stopped or it needs putting away. Whatever it is. Do you know what it is, Austerley?” Kirkgordon was rapidly regretting taking on his charge. “No.” Austerley shook his head slowly. “But if Zahn’s music is involved then it’s Eldar. It’s like before… Sorry.” The two misfits stared at each other, caught up in the common bond of the damned. The business jet was an extremely plush affair. Kirkgordon had never been in a Gulfstream V and at first he enjoyed the lavishness of the interior cabin. The arrival of a rather good-looking stewardess further enhanced his mood, although he did notice she had a discreetly holstered weapon. He thought using firearms on aircraft was rather risky and, given Austerley’s earlier outburst, a degree of surprise that Farthington would allow such armament crept in. The matter played on his mind until he fully perceived the shape of the weapon and recognized it as a dart gun. The gamekeepers were watching the rhino. Austerley was enjoying some rather fine wine. Kirkgordon didn’t take in the vintage or vineyard it came from but then he wasn’t actually listening to Austerley. He would nod his head occasionally but his mind was preoccupied. Two days ago he had been approached by one of Farthington’s men in his quiet local. He should have realized. The money was too good; the risk had to be high. But what really vexed him was the driving force behind his taking on this venture, a journey that was bound to take him back to that maddening fool who had gotten them into such a foul scrape underneath that accursed graveyard. Deep down he felt pity for Austerley. Something made him sympathetic to that blasted man. The things they had seen had bonded them together for better or, as it seemed now, for worse. Farthington was quite engaged by Austerley. They talked deeply of wines and culture, about Russia and its current battles and problems. But what most fascinated Farthington were Austerley’s days as a professor at Miskatonic University in Arkham. Strictly speaking, he had been Professor of Tribal History and Cuisine, but this was just a front. Austerley had been at the forefront of research into the Eldars. A walking encyclopedia of all things hidden in the deep, sent from outer space’s blackest regions, or, indeed, scattered throughout our known world. It was rumoured that Austerley had obtained a personal copy of the dreaded Necronomicon, and when questioned by Farthington he did not seek to deny this truth. The conversation continued gently enough until the mention of one name brought a slumbering Kirkgordon to life. “Did you say Carter? Don’t you even mention that name! You know where that took us last time.” Kirkgordon pointed an accusing finger at Austerley. Sweat was beginning to break out on his head. “You mean Randolph Carter?” quizzed Farthington. “Randolph bloody mad mannish freak Carter! Yes, Farthington, that damned lunatic,” said Kirkgordon. “Oh, he was no lunatic…” Austerley interjected, only to have Kirkgordon round on him again. Austerley felt brave enough to venture an excuse. Kirkgordon stood to speak but no words came out. He stared at Austerley as if trying to detect the joke but none was forthcoming. Austerley was completely genuine in his belief that what had happened in that grave was just an unfortunate mishap. “Churchy… thank you for getting me out.” With that, Austerley turned his own head to the window and the view outside. Kirkgordon stared at the chastised “lunatic” before him and fought to suppress the pity he felt for this troubled man. “You’re welcome, Indy,” he murmured under his breath. The rest of the flight consisted of a silence born from the hollow left by Austerley’s apology. Kirkgordon tried to get some sleep but he felt the sharp talons again on his back. In his dreams he saw a large winged creature, as black as his mood had been in the monastery. It would fade in and out of clarity but he could always sense the immenseness of the creature. Next, his mind would be violated by Warren’s half-digested face slamming into him. It had only just been recognizable from the black and white photograph of Warren at Miskatonic University. They had warned him but he hadn’t listened. No one would touch Austerley or even contemplate his work. But the money had been good for babysitting this eccentric yet daft professor. Kirkgordon’s lack of understanding of the Eldars had lured him into a false sense of security about the professor. Then it all drifted away into a spinning green cauldron, which unwound to reveal a picture of tropical warmth. A woman was holding a lizard. She was smiling, half at the creature and half at him, her new-found love. Part of him roared with hunger for the beauty before him. Her long, dark hair curving onto her shapely torso, hips he remembered holding in the throes of passion. He dreamt that he was holding her tight, tasting her neck, the saltiness of her sweat like honey in his mouth. Body reacting to and encouraging body, souls touching on that most ethereal of plains. And then it swooped! She was carried away by the winged creature, hanging from its talons like a redundant corpse. He fired at it, blasting until it was out of sight. All the time he heard Austerley screaming at the guns. “Twenty minutes to landing. Get yourself together, old bean.” Farthington smiled at the wakening Kirkgordon. Kirkgordon yawned and stretched and looked at the greyish cloud outside the window. He should have been going through the plans for Russia. How would they remain incognito? How would they track down this lead? Would they intercept, or just stake out the individual to see what he wanted? Would this mysterious threshold place be on time? But all he could see was a mother, a lover and, above all, the other half of his soul. Farthington had a plan. It seemed like a complete over-elaboration to Kirkgordon but Austerley was extremely excited by the prospect of so many black limousines arriving at the aircraft. Five in total would be arriving together and then driven off in various different directions to confuse “our Russian friends”. It wasn’t often that Austerley got to ride in such a palatial car and he was itching to go. Wrapped in a large winter parka, thick grey trousers and large black boots, Austerley was the closest in appearance to a typical Russian. Kirkgordon preferred to wear his trekking jacket with numerous tight tops underneath, but at least his black track bottoms and baseball boots gave him the look of an average Joe. Farthington remained in his crisp suit with white shirt and tie, over which was a large grey coat and an umbrella and bowler hat that completed the “civil service abroad” look. “Trust no one,” Farthington whispered to Kirkgordon on exiting the aircraft, handing him an automatic as they headed for the vehicles. “I don’t!” Kirkgordon retorted, promptly handing the weapon back. He never liked the idea of being armed unnecessarily. There was Austerley to think about. He’d start singing loony tunes if he caught a glimpse of the weapon. Also, the Federal Security Bureau were bound to be on their tail, otherwise, why bother with the limousines? Experience had taught Kirkgordon that it was often better to blend in than to stand out, better to talk your way out than to come out fighting. Austerley clambered into the middle of the back seat of the limo. Spreading out his limbs and his girth, he was in a good mood. At last some adventure was coming his way and he could start re-investigating the Eldars. Better than that, this Farthington guy seemed to want to bankroll it all. Funny how life worked out. Still, it was good to have Kirkgordon about. He knew how to handle himself and, what with early indications of Zahn, there was likely to be some action. As his thoughts turned to finding the seeker of Zahn’s music, Austerley was rudely pushed to the far edge of the seat by Kirkgordon. Farthington occupied the seat facing them and shortly afterwards the limo pulled away. “Where to?” Farthington inquired. “I refrained from asking until now so that none of the other drivers would know.” Although Farthington had been staring directly at Austerley, it was Kirkgordon who replied. “Did our expert tell you this?” Farthington looked at Austerley before flicking his head in the direction of Kirkgordon. Austerley had a quizzical look on his face, but it lightened at Kirkgordon’s reply. “I specialize. So, much appreciated, but I prefer my own gear, if you don’t mind,” smiled the former bodyguard. “Absolutely, old chap, but do not be tardy, we have a lot of work to do.” Farthington missed Austerley’s momentary look of panic on hearing that he supposedly had “ideas”. Austerley stared out of the window at the passing buildings and minutiae of everyday life. Bus stops, cars, new apartments, closed factories, older women carrying groceries. Everything had a grimness to its face. He knew the looks in the eyes of the people, the dashed hopes in their souls. It was a pervasive feeling despite the major changes in recent decades. He felt it too. Some people took hope from the small things of life continuing, from friends and family climbing the ladders. Too many years studying the Eldars had blunted this defence for him. Now he was as forlorn as these citizens. He wallowed in the pitiful scene outside. A final few calm moments before the flood. The door opening was a surprise, as the car was still travelling. It was slowing down, approaching some traffic lights, but still moving all the same and so the shock was palatable. Austerley had no time to react as he felt his collar pulled and he was half carried, half thrown from the car and smartly hauled down a nearby side street. Looking down he saw Kirkgordon’s boots. Bugger! This meant trouble. Farthington’s shout of “Stop!” could be heard behind them but Kirkgordon continued with the extraction and increased his pace. In a half-crouched form, legs stumbling, being pulled as he was, Austerley didn’t get any opportunity to raise his head. Instead, he saw pavements and road surfaces pass by. There were open doors and kitchen floors. Shouts went up, from residents he supposed, and the clatter of items falling from tables was heard in their wake. At first, he could hear Farthington’s shouts. Then the voices became Russian, with cries of “down here” and “cut them off over there”. Austerley was out of breath and feeling physically sick but his guide was relentless. Gradually, he realized that the hue and cry was dissipating and Kirkgordon was slowing. Then came the darkness and the slamming of a metal door behind them. Nausea overcame Austerley and he threw up on the floor. He started to cough but felt a hand clasp his mouth with a quiet but sharp “shush”. Time spent in the dark is often hard to quantify but Austerley reckoned a good ten minutes passed before the hand released his mouth. Outside he had heard the world continue in its quiet way, a distinct jackhammer punctuating the relatively calm back street his hidey-hole was in. Once, a couple of girls giggled their way past, and he also heard a man with a gruff voice shout into a mobile phone insisting he was not “bloody well late”. Austerley’s command of Russian was good and he recognized the local accent of all these voices. Racing through his head were random ideas of why Kirkgordon might have taken such evasive action. Nothing untoward had happened. Clearly, Farthington had been shocked at the developments. Eventually the silence had lasted long enough for Austerley to venture a question. “Wh…” He was cut off immediately by the hand going over his mouth again. The hand didn’t remove itself from his mouth so Austerley just shook his head gently. He felt Kirkgordon’s breath on his neck, controlled but deep. Although the outside ambience was all that could be heard, the internal whirring of Kirkgordon’s mind was all too evident. Austerley’s suspicions of the ever-increasing proximity of the owner of the voice. “Ah, Mr Austerley, if you would be so kind as to step out from…” Thud! Austerley gingerly stood up and peered over the boxes to see a prone man wearing a grey bomber jacket and black trousers with black boots. Then his eyes were drawn to the figure at the door beckoning him forward. “Indy, move!” came the hushed but imperative call. In his haste, Austerley’s footsteps rang out inside the container. An exasperated “Flaming nora” introduced another neck grab and frogmarch. Thankfully, five minutes later Kirkgordon concluded their escape and hastened them both into a shambolic roadside café. “Get the coffees, then come over and sit down. I’ll explain what’s going on,” Kirkgordon whispered. Austerley waited in the small queue before ordering. He had to adjust his accent once he had heard the lady behind the serving counter speak. They were not as far downtown as he had thought. Still, a coffee was welcome, if only to wash the sick taste out of his mouth. Kirkgordon had found a table near the back of the café as far away from the stewed vegetable smells of the kitchen as possible. The room had one entrance from the street, one into the kitchen beside the serving hatch and one further one with nearby toilet facilities indicated on it. 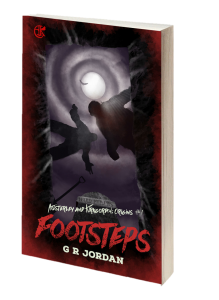 Having positioned himself at a table close to the toilets, Kirkgordon was surveying the street and kitchen doors. The café was about half-full, mainly of workmen with large coats and fluorescent tops covering boiler suits. “Why did we have to run?” Austerley asked. “Exactly. It’s not. How do you know he’s really government, by the way? Do you trust his card?” Kirkgordon sniffed offence at Austerley. “Federal Security Bureau? You killed an FSB man? Hell!” Austerley was shaking now. “…Why?” The question was dragged out slowly and reluctantly from his mouth. He didn’t want to see these particular dark elements again. It was now sometime after midnight and Kirkgordon felt as lost as he had back in the café. Austerley had taken him on a wild goose chase around Moscow, first finding out exactly where they were and then tracking down some old contacts. Most of Austerley’s previous acquaintances had supposedly been rounded up by the “authorities”. This seemed questionable, as the methods for rounding these people up seemed too sloppy for the FSB. Indeed, there had been a few deaths that had been seen in public. How had it got to this? thought Kirkgordon. The night chill made his breath appear in front of him in white condensation and he was thankful for the woollen hat perched on his head which he had stolen from a market stall. Well, not really stolen, as he had lobbed a few notes onto the stall table out of the view of the purveyor. Keeping hidden was paramount at this time. Thankfully, for all his hamfistedness, Austerley blended in perfectly with this culture. Morose and wrapped up like a duvet convention, he even had that depressive amble. Dammit, he was made for here. They were crouched behind some cardboard boxes, waiting in the gloom of an alleyway for one of Austerley’s contacts. Despite having interrogated the former asylum inmate about this contact, all Kirkgordon had got out of him was that he would know who the contact was when he met him. It was now six hours since they had last seen any FSB and neither had there been further pursuit from Farthington. And yet, there was more of an edge now to Austerley. He would rock nervously side to side as he waited, chewing on his lip despite the cold air. The large gloves he was wearing didn’t disguise that he was counting his fingers through them. What was making Indy so edgy? The condensation spat out from Kirkgordon’s mouth as he inadvertently whispered a solemn prayer. His senses were screaming something at him. There was the smell of decay, of bodily corruption, in the air. The hairs on his arms rose as one. Then came the tap of a cane on the cobbled alley surface. The figure groped along the shadows of the alleyway, leaning heavily on its aid. Kirkgordon could have sworn Austerley was positively shaking as the figure came closer. As it reached them, it blended into the shadows and it was impossible to make out any distinction beyond the fact it that was vaguely a biped. The figure spoke a few guttural utterances to Austerley which Kirkgordon struggled to understand. A wave of a presumed hand left the bodyguard believing that the reason for his accompanying Austerley was being debated, but he could make out little else. Despite his obvious discomfort, Austerley was soon peppering the shadow figure with questions regarding Zahn’s music. The grunted half-sounds that returned were clearly being understood, as Austerley consistently pushed for deeper answers. It was less than five minutes before the unknown figure was tapping a retreat back down the alley, the cane once again clipping its way in a choppy rhythm. Austerley stood and watched until it had disappeared. “He created some of the most magnificent, if distasteful, of images. I acquired one in Paris once, from a very small back-street dealership. The fool never knew the real value of it.” Austerley pondered deeply. “It was astonishing how lifelike he made the damn things. But then I guess he didn’t need an imagination.” Closing his eyes, Austerley drifted to a place far away, to a framed work of art he had once held in his hands. Yes, it was damned good. “What on earth are you on about?” interrupted Kirkgordon, stabbing a finger into Austerley’s side to wake him from his reminiscences. “So who was that? Was it Pickman?” Kirkgordon was frustrated at being unable to enter the loop of Austerley’s mind. The occasional distant car could be heard from the nearby road, its diesel engine thumping into the night. Otherwise, the only sound was the steady swish and swash of the river up against the banks. The recent cold spell had left the river at a lowish ebb and it was more lapping than flowing against the embankment edges. A stillness was in the air, due to the common sense of all but two creatures to get inside and remain there until sunrise. Sat under a bridge, one of the creatures was trying very hard to focus on certain material facts and not to drift into pondering where certain encounters had come from or were going to. The other creature had drifted into these worlds in his mind many moons ago and positively enjoyed his musings, if not the acquaintances that one met during these explorations. “Okay, Indy. All things considered, what have we got to go on?” Kirkgordon was forcibly calm, easing each word out in a perfect rhythm, showing he was in control. But he was having to work damn hard at it. times I wish you’d been left to rot in that graveyard. Or that loony house. Just tell me what he or it or whatever that blasted thing was said! No more, no less. Got it?” Kirkgordon was an inch from Austerley’s with a coiled torrent of anger on his face. Austerley gulped. “All right, Churchy, let’s go. I need my bloody bed, mind!” They trudged back up to the street from under the bridge. All was quiet, and Kirkgordon started to map out how getting into the soon-to-emerge street was going to go down. Then a thought struck him.